Due the technology boom in the late 1990s, which was coincidental with the rapid expansion of globalism and open innovation, and was then amplified by the less-than-stellar behaviors of certain countries, IP began to increase as a corporate priority. As is the case when companies need to get their arms around new issues or opportunities, IP was first formed as “its own thing.” There was an “IP Department.” Executives know that they must subsequently facilitate the integration a new requirement or capability into the right places in their organizations. Leading companies began to do it around 2005. For example, IP professionals were collocated in R&D and had dual reporting relationships – among many other techniques. There was another issue though. That issue remains today. Valuing IP is a real bear. Little by little industry is building experience as each transaction occurs. However, it is still the wild west. The value is what you are willing to pay for it. Finance folks rule the roost. Accounting folks are a long way from being able to assign standard values. But, as experience builds, standard-like values will emerge as industry gains more and more examples for reference. For certain types of commodity IP, standard ranges have already formed. Well, as IP integration and uptake occurs, metrics follow. Patents and Trademarks have long been metrics used by R&D and Product Development. They are three of the top five still, and will likely remain. 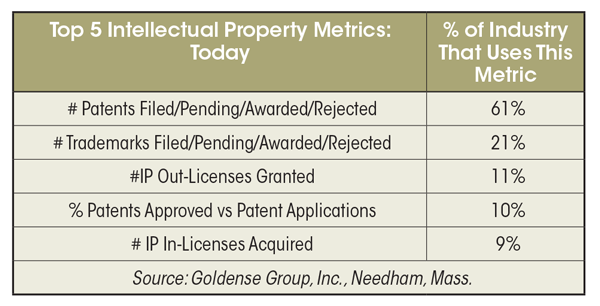 But, two of the top five penetrating IP metrics have now been superseded by “licensing.” “Number of Out-Licenses” and “Number of In-Licenses” have cracked the top five IP metrics now used across industries by the innovation functions. Licensing is another form of codified IP, like patents. Note that industry is still counting “its,” as it still does with patents (vs. “monetized revenues and/or profits”), but this is a clear sign of the progress of integration and awareness building. Measuring Intellectual Property: Top 5 IP Metrics [Machine Design – October 2017] looks at the gradual inroads that IP metrics are making in the overall measurement of product development performance; and identifies the Top 5 IP Metrics used by R&D and Product Development. GGI started doing primary research on the penetration of specific metrics in R&D and Product Development in 1998. Now 2017, about 20 years time, we have taken the pulse six times. Once every 3-4 years is a good cadence for R&D. Process change takes more time in long duration business functions, such as the innovation functions, and then metrics follow. There are always incremental changes in each research effort, and a few new metrics like the “Vitality Index” and “ROInnovation” that arise out of the blue, but the overall tenor remained the same. CEOs accepted “activity metrics” from R&D. This has been true since the start of my career. Well, evolving from the economic challenges of this past decade, CEOs now expect business performance metrics to a much greater extent. Activity metrics still prevail among the top cross-industry metrics, but the tide has clearly shifted. New Product Revenues (aka Vitality Index) cracked the Top 10 in the early 2000s. But, not a single measure of profit could be seen – until recently. The additions, changes, and rearrangements in the Top 10 won’t knock your socks off. But, given the decades of historical consistency, this is great progress in the advancement of management science for the creative functions. We looked at 101 different corporate-level metrics. Here are the Top 10. You be the judge. Top 10 Product Development Metrics: Then & Now [Machine Design – September 2017] identifies the top ten metrics, the degree of penetration across industries, and discusses the macro change that has taken place in the recent decade.